Omicron Delta Kappa (ODK), a national leadership honor society for college students, faculty, staff, administrators and alumni, is celebrating its 100th anniversary Wednesday. During the celebration, ODK will be honoring new members at an initiation and centennial celebration. The Dec. 3 date was selected for the event because ODK was founded on Dec. 3, 1914 at Washington and Lee University. Each year, new members are inducted into the society during tapping ceremonies around campus, marked by the ringing of the ODK bell as new members are tapped. Members of UM’s ODK chapter range from President Donna E. Shalala and Dr. Pat Whitley to newly tapped juniors and seniors. This year’s class includes women’s basketball coach Katie Meier. 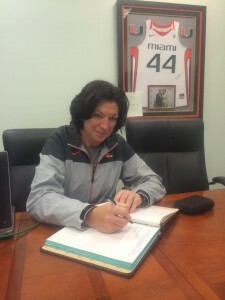 Meier is in her tenth year as head coach at UM and has received multiple awards for her leadership and dedication, including being named Associated Press National Coach of the Year in 2011 and being recognized as co-recipient of the 2013 USA Basketball National Coach of the Year award. The society recognizes achievement in five areas: scholarship; athletics; campus/community service, social/religious activities, and campus government; journalism, speech and the mass media; and creative and performing arts. It brings together leaders on campus exhibiting high standards in all sectors of collegiate life. Senior Geisy Sanz was humbled when inducted as a class of 2014 tappee. This year, Garcia has focused on making headway with celebrating the tradition and longevity of Omicron Delta Kappa during its anniversary. Omicron Delta Kappa headquarters selected the University of Miami chapter to host the ODK Drive-In meeting in February. This event allows members to network with students, faculty and alumni.